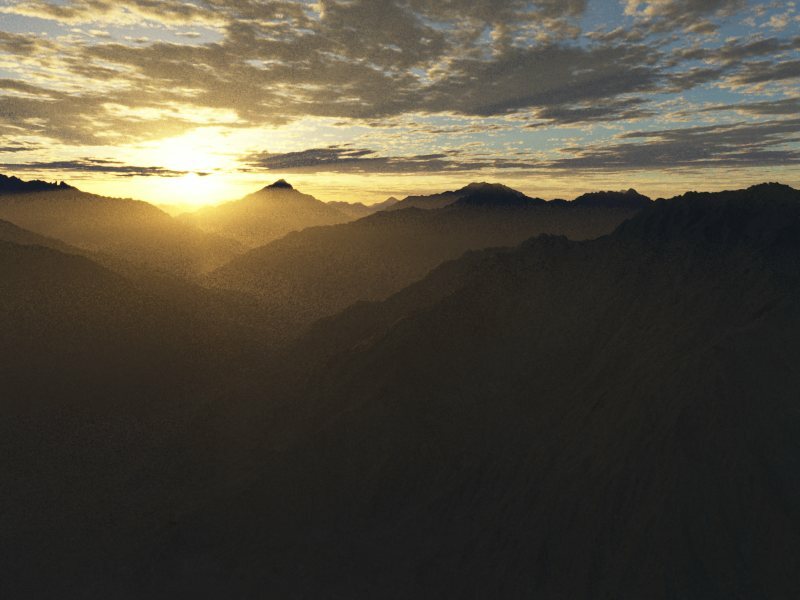 First of all Terragen allows you to play with the technology with very few limits for free. Trying before you buy is critical. The second reason is that I found it more intuitive than my quick tests with Vue, so I thought I would play with it first. I think I’m going to try and script a way of generating sky boxes if I find the time and I might also use it for rendering out planets for space scenes. If my tests go well enough I might pick up a license. The $399USD for the animation version is a bit steep so I will have to see if I get a good ROI on my investment before I shell it out. I think there are some really good examples here. Some are commercial and some are free. gui_node_pos = "660 -160 0"
gui_network_view_position = "799.8521668 -120.403373 0"
gui_network_view_size = "519 307 0"
gui_node_pos = "640 0 0"
position = "90.80148193 1061.064146 -1142.72722"
rotation = "-8 30 0"
name = "Render pixel sampler 02"
gui_node_pos = "960 -180 0"
gui_node_pos = "1160 -120 0"
gui_node_pos = "320 0 0"
ambient_colour_on_surfaces = "0.6499999762 0.8000000119 1"
ambient_colour_in_atmosphere = "0.6499999762 0.8000000119 1"
global_tint_on_surfaces = "1 1 1"
global_tint_in_atmosphere = "1 1 1"
colour_on_surfaces = "1 1 1"
colour_in_atmosphere = "1 1 1"
gui_node_pos = "320 -60 0"
colour = "1 1 1"
gui_node_pos = "0 -60 0"
centre = "0 0 0"
gui_node_pos = "200 0 0"
colour = "0 0 0"
alpha = "0 0 0"
centre = "0 -6378000 0"
rotation = "0 0 0"
atmosphere_shader = "Altocumulus layer 01"
gui_node_pos = "0 340 0"
haze_horizon_colour = "0.349999994 0.349999994 0.349999994"
bluesky_horizon_colour = "0.224999994 0.3585940003 0.4499999881"
bluesky_additive_colour = "0.05000000075 0.270938009 1"
bluesky_density_colour = "0.1000000015 0.3400000036 1"
redsky_decay_colour = "0.9048374295 0.7117702961 0.3678794503"
high_colour = "0.3440000117 0.3440000117 0.3440000117"
low_colour = "0.0009923999896 0.01346999966 0.0009923999896"
name = "Heightfield shader 01"
gui_node_pos = "-920 720 0"
heightfield = "Heightfield generate 01"
ambient_light_colour = "0 0 0"
name = "Heightfield generate 01"
gui_node_pos = "-720 780 0"
gui_node_pos = "-920 500 0"
input_node = "Fractal terrain 01"
gui_node_pos = "0 -80 0"
gui_node_size = "240 320 1"
gui_node_colour = "0.8000000119 0.8000000119 0.8000000119"
gui_node_pos = "-720 660 0"
gui_node_size = "640 440 1"
gui_node_colour = "0.2119999975 0.5174000263 0.1138999984"
gui_node_pos = "-720 220 0"
gui_node_size = "640 280 1"
gui_node_colour = "0.7968999743 0.1604000032 0.1604000032"
gui_node_pos = "200 720 0"
gui_node_size = "640 240 1"
gui_node_colour = "0.1000000015 0.5 0.349999994"
gui_node_pos = "200 290 0"
gui_node_colour = "0.2310000062 0.3203999996 1"
gui_node_pos = "320 -80 0"
gui_node_colour = "1 0.7299000025 0.2195000052"
gui_node_pos = "640 -80 0"
gui_node_colour = "0.3021000028 0.2673999965 0.4647000134"
gui_node_pos = "973 -80 0"
gui_node_size = "266.0336416 320 1"
gui_node_colour = "0.7372000217 0.3440000117 0.2119999975"
name = "Fractal terrain 01"
gui_node_pos = "-920 600 0"
input_node = "/Heightfield shader 01"
name = "Altocumulus layer 01"
gui_node_pos = "0 220 0"
local_sphere_centre = "0 4152 0"
density_shader = "Density fractal 01"
cloud_colour = "0.349999994 0.349999994 0.349999994"
scattering_colour = "0.349999994 0.349999994 0.349999994"
name = "Density fractal 01"
gui_node_pos = "200 280 0"
name = "Water shader 01"
gui_node_pos = "0 780 0"
decay_tint = "0.75 1 0.5"
volume_1_colour = "0.5 0.5 0.5"
Nice picture for 5 min. work ! Maybe you can help me: i’m desperately looking for the way to render separate channels and passes for compositing (RGBAZ, normal maps, global illum, ambient occlusion, shadows etc.). Where the hell can i find that ?? I am assuming you mean rendering those channels out in Terragen? I haven’t done any professional work with Terragen. I think that you are in luck for depth information as there appears to be a distance shader. Check out the various links listed here. I’m not sure if the rest are available. Yeah found the disance shader and i could already get a ZDepth channel. Other channels rendering won’t be to hard to find; the thing is you have to do everything by yourself in this software, by connecting the right nodes. But thank you for the link !